2019 BMW C 650 GT. Picture credits - BMW. Submit more pictures. The new C 650 GT features a distinctive and modern rear section with an appealing look and a new rear light. Details such as the �GT� logo stitched on the seat and the new handlebar cover with a high-gloss centre section and chrome highlights emphasize the particularly sophisticated and exclusive character of the C 650 GT. The higher mirrors vibrate less and provide a better rear view. Price as new (MSRP): US$ 10995. Prices depend on country, taxes, accessories, etc. Rear brakes: Double disc. ABS. Floating disc. Two-piston calipers. 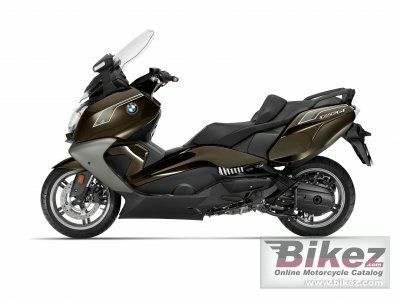 Ask questions Join the 19 BMW C 650 GT discussion group or the general BMW discussion group. Enter your e-mail to join the 2019 BMW C 650 GT forum and get notification of answers and new messages about this bike. You can unsubscribe with a single click. Bikez does not display, sell	or misuse e-mail addresses. Bikez has discussion forums for every bike. View comments, questions and answers at the 2019 BMW C 650 GT discussion group. You can sign up for e-mail notifications when other riders answer you. If you have extensive experience with the MC, please send us a review. If you consider buying this bike, you should view the list of related motorbikes Look at photos. Compare technical specs. And check out the rating of the bike's engine performance, reliability, repair costs, etc. You can compare the rating with other bikes.